Book Review Passage By Linda Foard Roberts Reviewed by David Ondrik Passage is an elegiac portrait of the artist’s family, infused with an open, tender love seen through flesh, cherished objects, and landscape. The care and attention required to use a large format film camera is evident — this is the product of labor and craft combined with a deep connection to what’s being photographed. Passage. By Linda Foard Roberts.Radius Books, 2016. Photographs by Linda Foard Roberts. Text by Billy Collins, Russell Lord, and Deborah Willis. Radius Books, Santa Fe, USA, 2016. 176 pp., 80 black-and-white illustrations, 10x12". 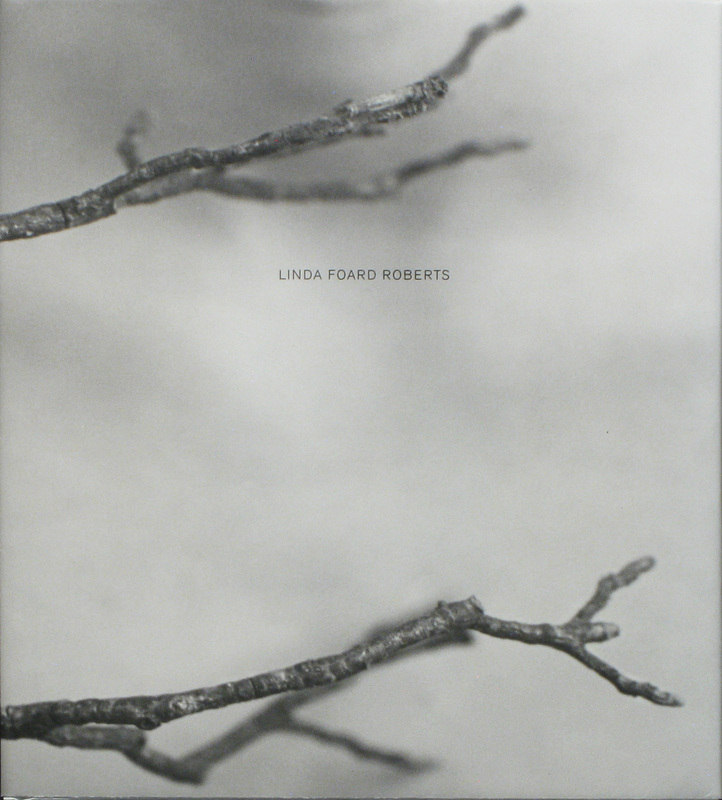 If you enjoy Pictorialism, the 19th century movement of soft focused photographs concerned more with emotion and mood than representation, Linda Foard Roberts’s debut monograph Passage will be deeply satisfying. 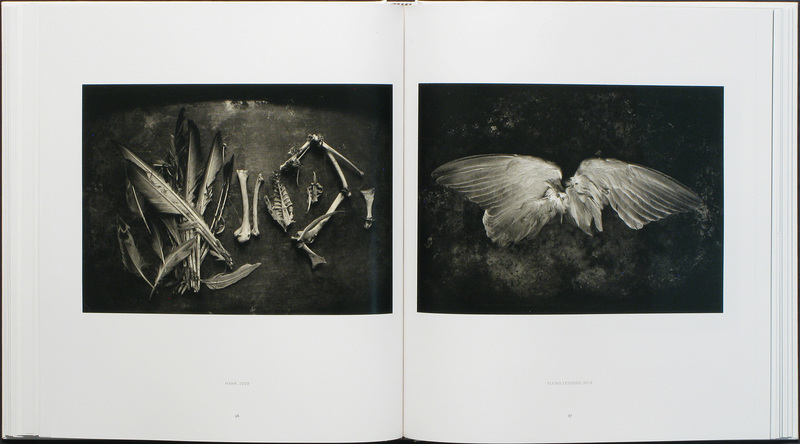 The book is a hefty 10” x 12” with 80 nuanced, warm-tone reproductions of Roberts’s black and white gelatin silver prints. It opens with a brief statement by Roberts, followed by eminently readable essays by Russell Lord and Dr. Deborah Willis. Passage is an elegiac portrait of the artist’s family, infused with an open, tender love seen through flesh, cherished objects, and landscape. The care and attention required to use a large format film camera is evident — this is the product of labor and craft combined with a deep connection to what’s being photographed. Each of the five sections (Passage, Grounded, Simple Truths, Alchemy, and Becoming) is introduced by thick, textured paper embossed with Roman numerals. 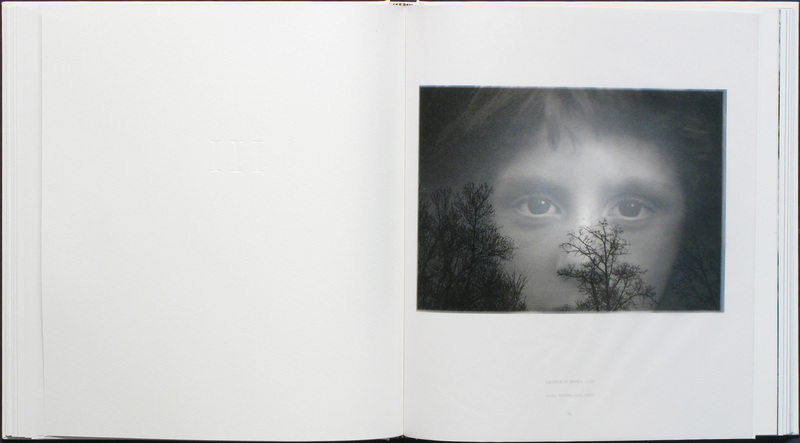 Immediately following each embossed page is a photograph on translucent vellum that overlays the image on the next page. This veiled, double exposure effect is a thoughtful accent that enhances the tactile interaction of turning through the pages. It shows an attention to the possibilities of the book as an interactive object, rather than a “pocket gallery” of photographs. There are short introductory statements from the artist that set the tone for each section. The quality of the images, and their reproductions, is immediately seductive and enhanced by expert sequencing and book design. 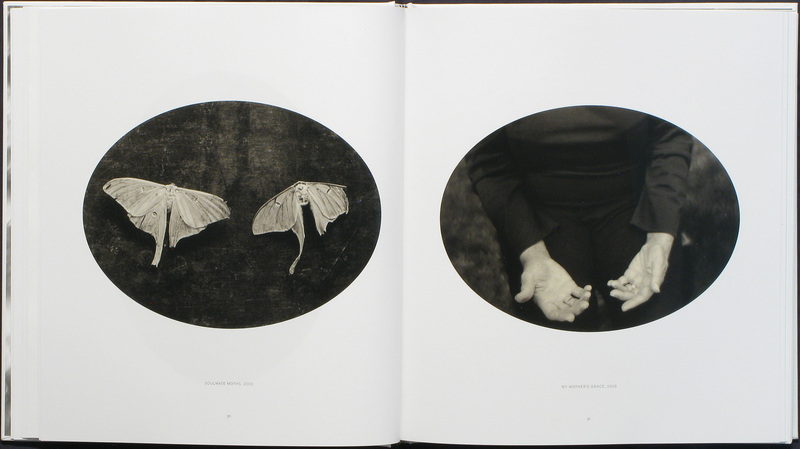 On pages 30 and 31 are facing images, Soulmate Moths and My Mother’s Grace, one is of two dead moths and the other is of the artist’s mother’s hands. Tonally the images echo each other — the dead moths are light patches against a dark ground, while the hands are stark against a similarly dark ground. There’s also a wistful conceptual entwining — the moths have worn out and perished, while the mother’s elderly, worn hands imply inevitable mortality. While there’s a melancholy tone to most of the images in this book, there are some notable departures, like A Measure of Time, Both Thirteen Years Old. This portrait of the artist’s 13-year-old son leaning against a 13-year-old tree, presumably planted on the occasion of his birth, illustrates the connection the mother has to the child as well as the landscape she’s created at home. The motion blur of the swaying leaves obscures the young man’s face and works as a metaphor for his impending transition from childhood to adolescence. The tree is a sturdy support, a reminder that, despite the impending changes and chaos of growing up, there will quite literally be a foundation to lean against. 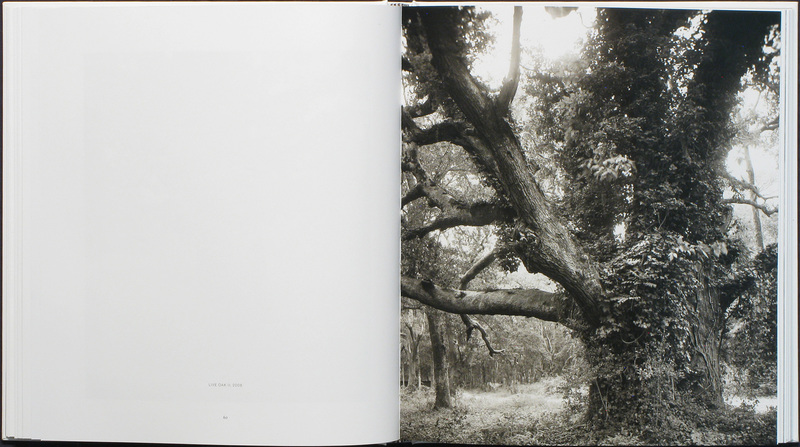 One somewhat jarring element is the fold-out page of four photographs of a tree on the artist’s property, each taken during different seasons and constructed with multiple negatives. While I sympathize with the problems unusual image dimensions mean for books, the fold-out is an awkward solution that diminishes the photos by creasing them. Also, the dust jacket feels thin, like ordinary copy paper, which is a surprise considering the high quality of materials and printing in the rest of the book. Under the jacket is a wonderful, white cover with a tipped in image of a gnarled and ancient oak.